The United States has often been described as a religiously diverse country, an image celebrated in forums ranging from scholarly work to a popular bumper sticker and even a recent Coca-Cola commercial during the Super Bowl. But, from a global perspective, the United States really is not all that religiously diverse, according to a new Pew Research Center study. In fact, 95% of the U.S. population is either Christian or religiously unaffiliated, while all other religions combined account for just 5% of Americans. As a result, the U.S. ranks 68th out of 232 countries and territories on our Religious Diversity Index. The new study treats all Christians as members of the same religion. The U.S. has an enormous variety of Christian denominations, and if diversity within the world’s largest faith were taken into account, the United States likely would rank higher. But the study treats Christianity no differently than Islam, Hinduism, Buddhism or Judaism – all of which also have a lot of internal diversity, yet are considered as single religions in the study. The study looks at the share of each country’s population that belongs to eight major religious groups, including the unaffiliated (those who identify as atheist, agnostic or having no particular religion). The closer a country comes to having equal shares of the eight groups, the higher its score on the 10-point index. 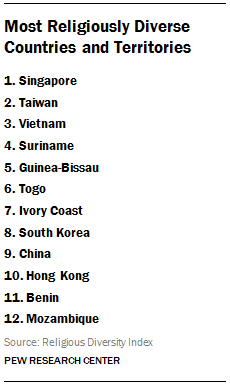 By this measure, Singapore is the world’s most religiously diverse country, followed by Taiwan and Vietnam. Six of the top 12 countries and territories on the Religious Diversity Index are in Asia (Singapore, Taiwan, Vietnam, South Korea, China and Hong Kong). Several of them have substantial Buddhist, Christian and unaffiliated populations, as well as many adherents of “folk” religions. At the other end of the scale, among the places with the least religious diversity are Vatican City (more than 99% Christian) and such overwhelmingly Muslim countries as Morocco, Somalia and Afghanistan. 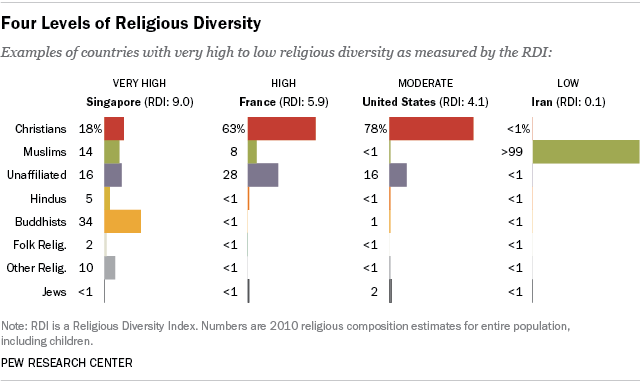 The U.S. is classified as “moderate” in terms of religious diversity. While adherents of many world religions live in the United States – the world’s third most populous country – most of those religions each represent less than 2% of the U.S. population. That includes people who identify their religion in surveys as Judaism (1.8%), Buddhism (1.2%), Islam (0.9%), Hinduism (0.6%) and folk or traditional religions (0.2%). There’s an important distinction between religious diversity and religious freedom, which this report does not measure. (We’ve studied global restrictions on religion, both in the form of government restrictions and social hostilities, in a separate series of reports.) The First Amendment to the U.S. Constitution, of course, guarantees the right to “free exercise” of religion, which has been celebrated by figures ranging from Alexis de Tocqueville to Norman Rockwell. But even as Tocqueville (in the late 1830s) wrote that the “sects that exist in the United States are innumerable,” he also observed that all those sects “are comprised within the great unity of Christianity.” The country has certainly changed over the centuries, but it remains a nation with an overwhelming Christian majority. Alan Cooperman is director of religion research at Pew Research Center.